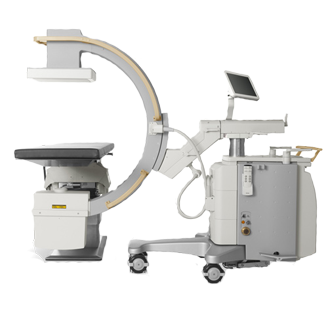 The Veradius is a powerful C-arm with flat detector and rotating anoje that brings the advantages of flat detector technology to the operating room, incorporating Philips new flat detector design for mobile fluoroscopy. Compact and easy to operate and transport, the system consists of a mobile C-arm stand for image acquisition and a Mobile View Station with two LCD monitors for image processing, review, archiving and display. The additional stand monitor supports visual control for the operator.